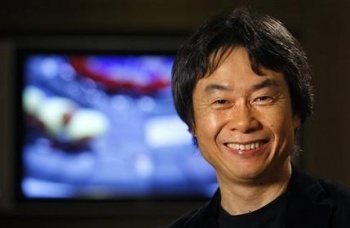 Legendary designer Shigeru Miyamoto says piracy is still a problem but used games really aren't on Nintendo's radar. Used games are a vexing issue for game publishers simply because they see no money from their sale. You buy a brand-new game, the publisher gets its piece; you buy it used, and all the green goes to the retailer. It's an issue that's really flared up during this year's E3, which has been dominated by the introduction of new consoles from Microsoft and Sony, but Miyamoto, the man behind Mario, says it's not really an issue at all for Nintendo. "For us it's less about used games and it's really more illegal copying of games that we're really worried about. By creating the games that we create and selling those games, it enables us to then create new versions of those games," he told CVG. "We're more worried about piracy and we think used games are a whole other story. In fact, from our perspective you want to create a game that people will want to keep and keep playing for a long time," he continued. "That's the approach that we always take and that's the best way to avoid used games." Regardless of where you come down in the debate over the relative evils of used videogames, I don't think anyone would argue that "make better games" is a better approach to cutting into the trade than a restrictive system of DRM. But will a permissive approach in a restrictive environment do anything to reverse the fortunes of the Wii U? That, as Miyamoto put it, is a whole other story.